True story. 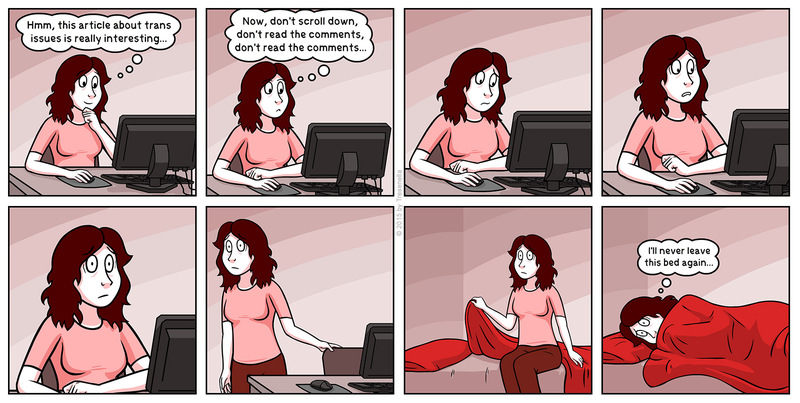 Whenever I get caught in a trans-related article reading session, I can’t help but also get caught in an endless loop of reading mean comments, getting depressed, then reading some more, then curling into a ball and start crying. Seriously, what’s wrong with some people? Why that much hate towards the transgender community? Oh my that is so true. It is bad enough with the transphobics, TERFs and religious bigots because you can automatically ignore them, they just hate us and seemingly always will. As far as they are concerned we are abominations, sexual freaks …or both. For some (like the religious bigot chuches) I suspect it is also a tactical move to attack the whole GLBTI community, with us being seen as the weak link. But what gets me is when some TGs attack other ones. That ‘real trans’, ‘non real trans’, ‘not trans enough’, ‘they are just crossdressing sexual perverts’, etc finger pointing nonsense that goes on sometimes. We have enough external enemies wthout infighting. Fortunately we have a lot of friends and allies and a more supportive and steadily more understanding general community. Things like your great comic strip really helps others understand us better. I post it on to so many places and people. Haters have to hate something in order to inflate their own fragile egos. Otherwise they’d have to hate themselves for being the pitiful putzes they are. That is all too true sadly. I try to explain why their reasoning is wrong and get insane amounts of hate and vitriol in Return. Chrostians say some of the most unchristian stuff ever. Also, I’m glad your back! We’ve missed your comics. Wow. Its easy to identify with her! The comments that are made on trans issues are unbelievably ignorant. Ignorance is understandable. No one knows everything. But refusing to learn, that I cannot understand. There is a great book by Julia Serano “Whipping Girl: A Transsexual Woman on Sexism and the Scapegoating of Femininity ” that explains quite a lot of the causes of this. Different hate groups have different (but often overlapping) motivations. The classic example is a transphobic (and always gay phobic as well) male. They live to a ‘male’ role that is defined purely in negative terms, that is being the opposite of ‘female’, there is nothing positive that they follow. The worst thing you can say to them (and the worst insult they give) is that “you xxxx like a girl”, where ‘xxxx’ is just about anything. People like this often don’t actually like females (except sexually) to the point of misogyny, hate gays (of course) and when a male transitions to a female it is incredibly threatening to them, it challenges their whole personal definition of ‘maleness’, of their whole identity. Naturally they react negatively to this, often with violence if they can. This is accentuated by the groups they socialise with, which tend to have the same mindset and then they egg themselves on, or live in fear of being ‘found out’ by the group that they are not quite as ‘anti-female’ as they pretend. Note that FtM ‘transmen’ don’t suffer this nearly as much (though they have their own issues and prejudices against them of course), because transitioning to being male is seen as a ‘step up’ and away from that dreaded ‘femaleness’. You can’t reason with these people because it is embedded in their definition of themselves (and their attitude reinforcing groups). Because their definition of being a ‘male’ is just being ‘anti-female’ then they tend to be very shallow and brittle, as well as pretty awful people overall as (usually) things like empathy, caring, gentleness, self control, ‘niceness’, heck even basic manners, etc are seen as ‘female’, so they go the opposite direction becoming ‘thuggish’ or ‘loutish’ in behaviour. If they were not so physically dangerous (to TGs, females, gays, weaker males, children, etc, etc) you could almost feel sorry for them, they are pretty screwed up people. Lisa: Unfortunately they vote and contribute money to organizations like the American Family Association, Abiding Truth Ministries, Concerned Women of America and dozens more. The right has lost this battle but they are like the Japanese soldiers who held out on Pacific islands for decades after the war ended. They won’t accept defeat. They will continue to spread lies about us and about the gay community until they can no longer afford the postage. I hope that everyone who reads this and similar comics, everyone who is transgender themselves joins the ACLU, the Southern Poverty Law Center, People for the American Way, Transgender Law Center, and groups of that nature who are fighting for us in court. When I started this post it was not meant to be a plug. If this offends anyone, my apologies. I’m a US Navy veteran who served on nuclear attack submarines and am still in transition. As such, I’m still not out to everyone and get so upset whenever my former shipmates unleash negative comments on social media. Most of it’s ‘boys being boys’ (how’s that for a cop-out) and playing along, but some of those hateful comments are from the heart. Interestingly, it’s not always conservatives either. I see a lot of hateful comments from “progressives” too. I’m gratified by many in the submarine veteran facebook groups that have accepted transgender SubVets and have fought for our inclusion in the groups. The philosophy by most is that if you’ve earned your ‘dolphins’ (are qualified in submarines), then you have a right to be there regardless of gender identity or sexuality. PattyPDX: “…hey are like the Japanese soldiers who held out on Pacific islands for decades after the war ended”. Lol. I must admit I think of them more like cockroaches, they keep popping up no matter how many you kill off. Crap like this is why I can’t leave my bed some days. One little misgendering and I’m stuck hiding for a day or more. I stay inside most days, but if I could prove that my soul is female, that we are all who we know we are, that maybe they would slowly treat us like human beings. They are just as scared, as many of us are. They don’ t like change. In many days they are childish. I no longer see myself as a joke, but as a woman. Love yourself, and never lose that flicker of light in your heart.